↑ Henry George Liddell; Robert Scott. "οὐρά". A Greek–English Lexicon. Perseus Digital Library. Retrieved 2010-05-24. ↑ F. Boßelmann; P. Romano; H. Fabritius; D. Raabe; M. Epple (October 25, 2007). "The composition of the exoskeleton of two crustacea: The American lobster Homarus americanus and the edible crab Cancer pagurus". Thermochimica Acta. 463 (1–2): 65–68. doi:10.1016/j.tca.2007.07.018. ↑ P. Chen; A.Y. Lin; J. McKittrick; M.A. Meyers (May 2008). "Structure and mechanical properties of crab exoskeletons". Acta Biomaterialia. 4 (3): 587–596. doi:10.1016/j.actbio.2007.12.010. ↑ "Japanese spider crab Macrocheira kaempferi". Oceana North America. Retrieved 2009-01-02. ↑ Richard von Sternberg; Neil Cumberlidge (2001). "On the heterotreme-thoracotreme distinction in the Eubrachyura De Saint Laurent, 1980 (Decapoda: Brachyura)" (PDF). Crustaceana. 74 (4): 321–338. doi:10.1163/156854001300104417. ↑ R. von Sternberg; N. Cumberlidge; G. Rodriguez (1999). "On the marine sister groups of the freshwater crabs (Crustacea: Decapoda: Brachyura)". Journal of Zoological Systematics and Evolutionary Research. 37: 19–38. doi:10.1046/j.1439-0469.1999.95092.x. ↑ Carrie E. Schweitzer; Rodney M. Feldmann (2010). "The oldest Brachyura (Decapoda: Homolodromioidea: Glaessneropsoidea) known to date (Jurassic)". Journal of Crustacean Biology. 30 (2): 251–256. doi:10.1651/09-3231.1. ↑ J. W. Wägele (1989). "On the influence of fishes on the evolution of benthic crustaceans" (PDF). Zeitschrift für Zoologische Systematik und Evolutionsforschung. 27 (4): 297–309. doi:10.1111/j.1439-0469.1989.tb00352.x. Archived from the original (PDF) on 2011-07-19. ↑ L. H. Sweat (August 21, 2009). 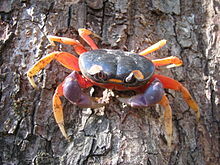 "Pachygrapsus transversus". Smithsonian Institution. Retrieved 2010-01-20. ↑ Martin J. How; Jan M. Hemmi; Jochen Zeil; Richard Peters (2008). "Claw waving display changes with receiver distance in fiddler crabs, Uca perplexa" (PDF). Animal Behaviour. 75 (3): 1015–1022. doi:10.1016/j.anbehav.2007.09.004. ↑ Jérôme Chablais; Rodney M. Feldmann; Carrie E. Schweitzer (2011). "A new Triassic decapod, Platykotta akaina, from the Arabian shelf of the northern United Arab Emirates: earliest occurrence of the Anomura" (PDF). Paläontologische Zeitschrift. 85: 93–102. doi:10.1007/s12542-010-0080-y.